Can’t see the slideshow? Click here! Although I’ve read about them before and seen videos, it was great to try out an eye-tracking device for myself. It took less than a minute to calibrate and get myself up-to-speed on what to do, and after that I was able to write sentences and get the computer to speak them back to me! The only downside was that, being a contact lens-wearer, my eyes felt a little dry afterward. Felt fairly futuristic, though, and potentially life-changing for some of the profoundly disabled students we’ll have at the Academy. I didn’t get a chance to check out how much these cost, but I think they’re a great idea. The photo above explains what I’m talking about: soundproof, circular ‘pods’ that allow for meetings, speaking and listening exercises, or some quiet study to take place. I can see these being used in break-out spaces, in reception areas for meetings with parents – for a whole host of things, in fact. The great things was that, whilst they’re soundproof, they’re comfortable and have clear windows so teachers can see what is going on. A great idea. Again, variations of the seating that was on display at the REAL Centre have been seen before, but it was good to see thought going into ergonomics. The seats, along with the tables, on offer could be stacked into a very small space to allow for drama-based activities. It was almost impossible to lean backwards on them such that the front legs came off the floor. You could, however, rock forwards slightly which was pleasing. Apparently these have been around for ages and, indeed, I seem to remember the Politics department at the University of Sheffield using something similar when I took some modules there in my first year (1999!) However, when paired with a projector you begin to wonder whether an interactive whiteboard isn’t just an expensive luxury that perpetuates an outdated system. Having a visualizer makes examining sources, ‘real-life’ stuff and students’ work much easier and much more likely to happen. Obviously there was more than just the above at the REAL Centre, but nothing I hadn’t really seen before. 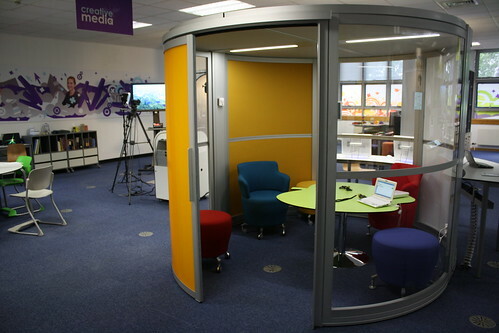 There was Lego Mindstorms stuff, a ‘teacher wall’ to provide space and cupboards around interactive whiteboards, flexible tiered seating areas, chroma key hardware, sensory equipment and a stop-motion animation studio, amongst other things. I’m a big fan of the touchscreen Asus Eee Tops that were on display there but, again, I’ve seen them before. All in all, a worthwhile and enjoyable day. RM have asked for feedback for which I’m pointing them towards this blog post. I’d advise them either to put price tags on everything or give brochures with clear prices immediately after the tour. It became a bit annoying for me, and embarrassing for them, having to ask how much everything costs at every turn! Next David Brandon on leadership. Previous Meeting with Ed.D. thesis supervisor: the confusion around ‘digital literacy’. Great post, Doug…love some of these toys! Pity that, as a cash-poor private school where we are constantly behind the times IT-tech-wise (and a bit stuck in the 19th century teaching-style-wise at times too), they may have to remain something I look at on others blogs rather than in my classroom! Another ‘take-away’ that I didn’t mention above is that it now seems pretty pointless to me putting interactive whiteboards into classroom and expecting changes in teaching and learning. I’d be spending money on projectors plus either visualizers or wireless slates. I’ve been looking forward to reading this post today as it ties in quite nicely with one particular point Education2020 were discussing last Friday on Islay; School design in the year 2020. The photos definitely show a classroom design that I and any class of students would embrace with enthusiasm and excitement. I can see your point. What is included in these rooms should be included in classrooms today, after all this is 21st Century technology. However, the problem we face is that many of us are teaching in old buildings, classrooms that are locked in leaving children with no room to move let alone space to learn. Technology is moving rapidly but budget increases and school designs are not. I’m visiting on 20th July thanks to reading this post Doug! Will feedback to my PPP team and ask nicely nay demand I and my fellow English teachers get decent sized rooms with areas available for different activities etc. Looking forward to visiting Abingdon.